The culture of the marine carnivorous Yellowtail Kingfish (YTK) in Australia is still in its infancy and the nutritional requirements for this species have not yet been established. The substitution of fish meal and fish oil with terrestrial-based protein and lipid ingredients in aquafeeds has presented a variety of issues associated with fish nutrition and health. In addition, the introduction outlines whether these dietary changes in combination with seasonally fluctuating culture environments, have a negative influence on growth and health. 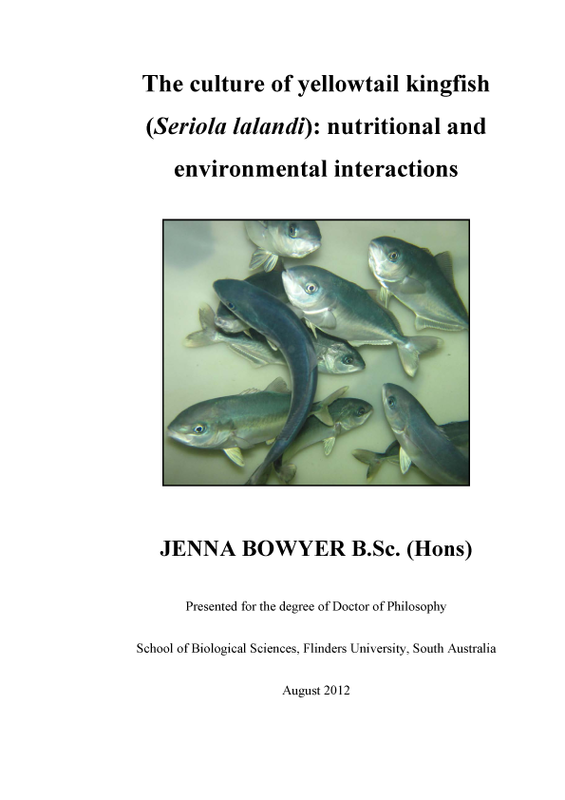 The main aim of this research was to improve our understanding of the somatic and physiological responses of YTK, at suboptimal water temperatures, to dietary fish meal and fish oil substitution using alternative dietary protein and lipid ingredients. This information could then be used to develop a more cost-effective and sustainable diet for the culture of healthy YTK during the early stages of the grow-out production cycle where fish are exposed to varying environmental conditions. YTK were best grown within 3 °C either side of the optimal temperature of 24 °C, under normoxic conditions, as growth was significantly reduced under hypoxic conditions. Digestive enzyme activities were not affected by dissolved oxygen, but water temperature did have a significant effect, with large reductions in trypsin activity at emily.mantilla@seafoodcrc.com if you require further information.